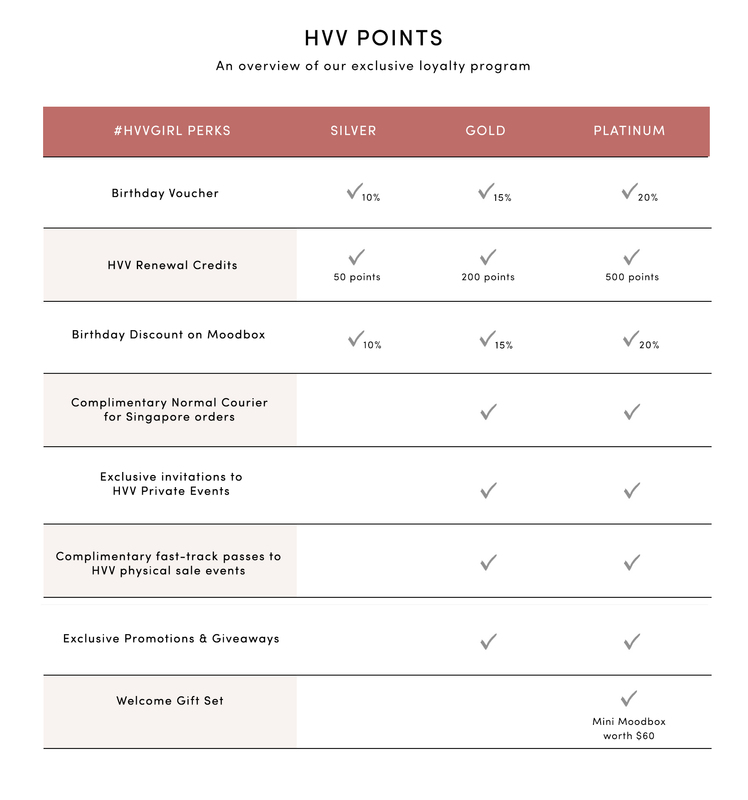 For every $1 spent at hervelvetvase, you'll be awarded 1 hvv point. How else can I accumulate points? For October 2018 - December 2018 we're also awarding 30 hvv points for every #hvvmoments image. If you've posted an #hvvgirl or #hvvmoments image, email us a screenshot of your OOTD & hvv account email address to receive points. 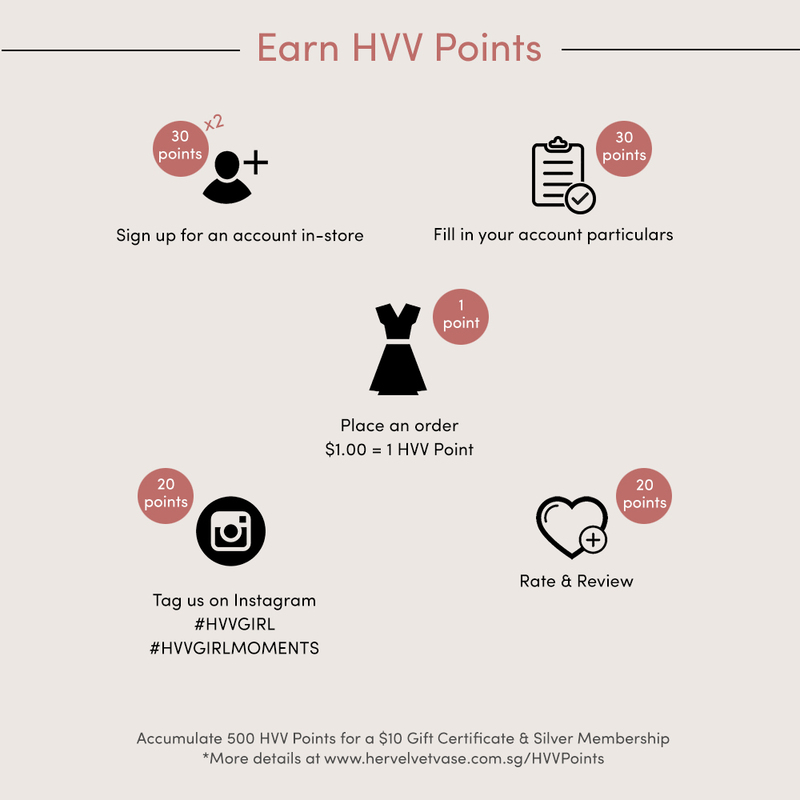 Once you've accumulated 500 hvv points, you'll be awarded Silver Membership and will also receive a $10 Gift Certificate. Thereafter, for every subsequent 500 hvv points you accumulate, you'll receive another $10 Gift Certificate. If your order is an in-between amount (e.g. $25.50), your hvv point accumulation rounds down (i.e. $25.50 = 25 points). 500 points is the minimum amount allowed for a gift certificate redemption (i.e. 400 points does not grant you $8 etc.). Your $10 Gift Certificate will only be applicable on your first order after achieving hvv Silver Membership status. Your $10 Gift Certificate is automatically credited into your account. Upon checkout, you may select it to be applied to your order. You may only utilise one $10 Gift Certificate per order with us. hvv points earned before 1st January 2017 expire within a year. hvv points earned from 1st January 2017 onwards expire within 3 years. #hvvgirl image: Points are awarded for images featuring recent purchases that are non-repeated. Complimentary Normal Courier is automatically applied when a local mailing address is keyed in upon checkout. Complimentary Normal Courier cannot be combined with any other discounts. Only one discount may be utilised at any one time. Complimentary Normal Courier can be combined with store credits.